There was plenty scientists did not know about the planet when the Juno spacecraft left Earth in 2011, and the probe has sought answers to questions about Jupiter’s interior, magnetic field, auroras and radiation belts, and used a visible light camera to capture the first direct views of the poles. Since Juno arrived at its destination July 4, 2016, to wrap up a five-year interplanetary trip, the spacecraft, built and operated by Lockheed Martin, has circled Jupiter six times in an oval-shaped loop that extends a few million miles at its farthest point. Each lap takes more than 53 days, and Juno speedily skirts within 3,000 miles (5,000 kilometers) Jupiter’s cloud tops at closest approach. Juno’s science instruments collect most of their data when the orbiter is near Jupiter, taking pictures, measuring plasma and electrons, and probing deep inside the planet to find out what is hidden under its cloudy veneer. Many scientists thought Jupiter was “relatively boring and uniform” inside before Juno arrived, Bolton said. Juno’s microwave radiometer, an instrument similar to those aboard climate satellites looking down on Earth, gathers sounding measurements to peer below the red-orange tapestry of Jupiter’s cloud tops. The radiometer is tuned to six wavelengths, detecting thermal radiation emitted from different layers of the atmosphere from the storm clouds and jet streams to as deep as 300 miles, or about 500 kilometers. Going into Juno’s mission, scientists anticipated Jupiter’s atmosphere to be relatively consistent deeper than 60 miles, or 100 kilometers. 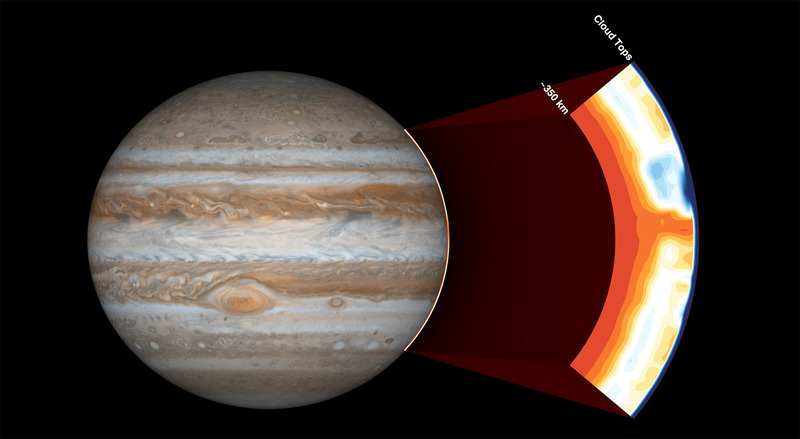 Instead, Juno’s microwave radiometer discovered a belt of ammonia around Jupiter’s equator, and variations in ammonia abundances at other latitudes extending deep into the planet’s atmosphere. The ammonia band may penetrate even deeper inside Jupiter, Bolton said. The findings suggest more ammonia farther down in Jupiter’s atmosphere, and the ammonia detections appear to have no relationship with the zones and belts of clouds visible in pictures from space. “That’s really going to force us to rethink not only how Jupiter works, but how do we explore Saturn, Uranus and Neptune if they are highly variable like this?” Bolton said. Other parts of Juno’s scientific sensor suite are mapping Jupiter’s gravity field to learn about the heart of the planet. Theories about Jupiter’s core before Juno arrived predominately predicted the planet either had a small, dense rocky core between one and 10 times as massive as Earth, or no core at all, scientists said. “Most scientists were in one camp or the other, and what we found was really neither was true,” Bolton said. “There may be a little bit of a compact core, but there may be layers there, and there seems to be a fuzzy core that may be much larger than anybody had anticipated. Jupiter’s intense magnetic field, the strongest of any planet in the solar system, has also been interrogated by Juno, which has a magnetometer mounted at the end of one of the craft’s three solar array wings. Jack Connerney, Juno’s deputy principal investigator at NASA’s Goddard Space Flight Center in Maryland, described the magnetometer as like a “fancy compass” that can measure the direction and strength of Jupiter’s magnetic field. Juno has come closer to Jupiter than any mission before, and proximity yields better magnetic field measurements, Connerney said. The fluctuations detected by Juno suggest the spacecraft is unexpectedly close to the magnetic field’s source, or dynamo. 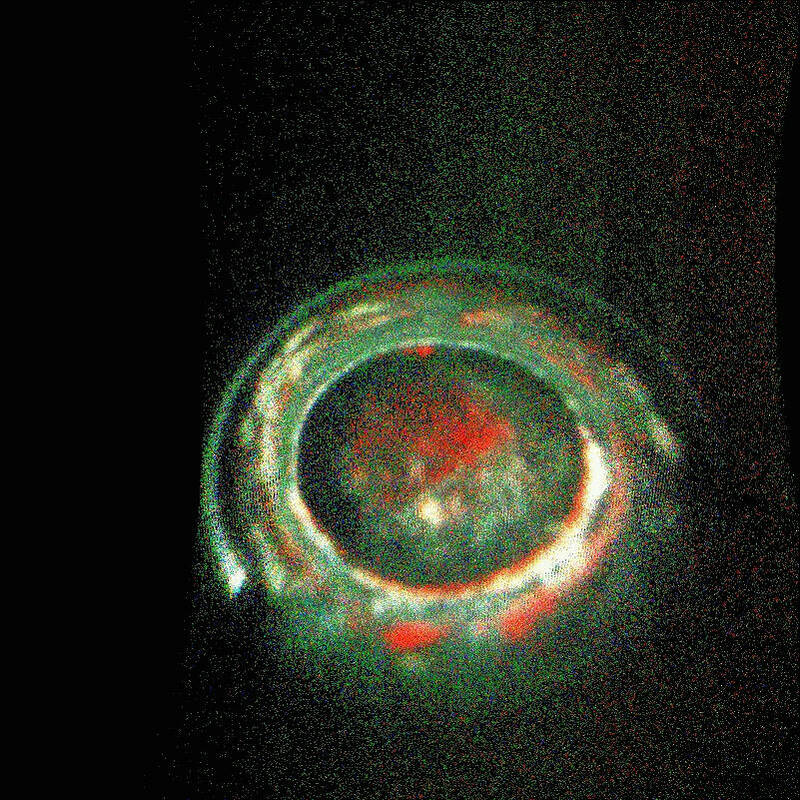 Scientists thought the magnetic field might be generated in a global pool of liquid metallic hydrogen in Jupiter’s middle layer somewhere between the center of the planet and the atmosphere. Squeezed at extreme pressure, the deep layer of hydrogen is liquified and conducts electricity. The magnetic field expands outward from Jupiter and is blown back by the solar wind like a comet’s tail. The magnetic field bubble, called a magnetosphere, is similar to one around Earth, but Jupiter’s is so immense it would be the size of the full moon in the sky, if it was visible with the naked eye. 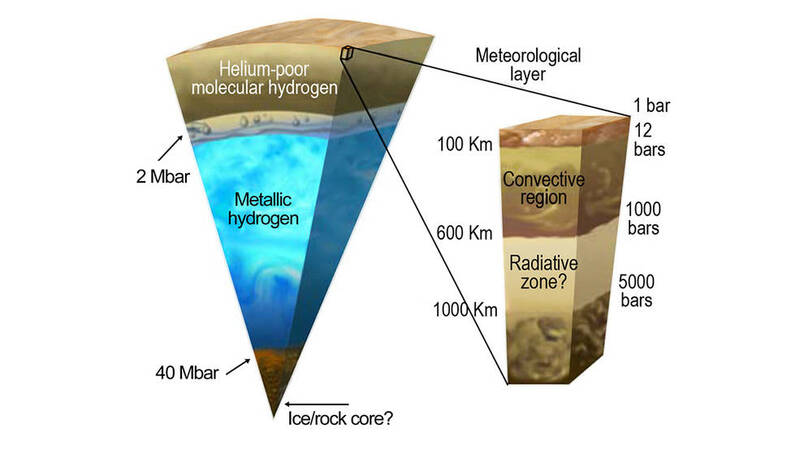 Juno’s observations “might mean that the dynamo is above that metallic hydrogen region,” Connerney said, perhaps in an envelope of molecular hydrogen. An infrared camera and ultraviolet spectrometer aboard the Juno spacecraft have been looking at Jupiter’s powerful polar auroras, producing another set of observations that surprised scientists. It turns out some of the auroral light emissions seem to be produced by electrons streaming out of Jupiter’s atmosphere, not by charged particles riding field lines into the planet, as is the case with Earth’s auroras. One of Juno’s instruments, an electron detector, found particles moving upward as the orbiter soared over Jupiter’s south pole. According to Connerney, the electrons are probably drawn out of the planet along the same field lines scientists thought would see the particles into Jupiter. NASA’s Cassini spacecraft, in the final months of its mission, is now orbiting Saturn on a trajectory similar to Juno’s. 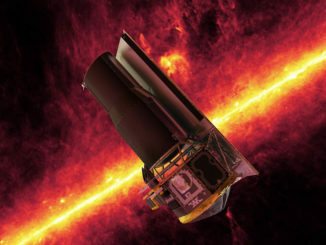 Bolton said scientists are eager to compare observations from the two craft to compare the solar system’s two largest planets. “Cassini doesn’t have the exact same kind of instruments we have, and of course, we’re tuned to do this interior research, but it has a lot of great instruments that can learn a lot about the interior and other things that it can do close-up,” said Bolton, who is also a member of the Cassini science team. Juno’s camera has scanned Jupiter during each pass over the planet’s poles, catching dozens of swirling storms in the act, some the size of Earth. The Juno team relies on amateur observers and image processors logged in to the mission’s website to crunch raw views from JunoCam and create colorful mosaics. “What you see are incredible, complex features,” Bolton said. “These cyclones and anticyclones all over the poles. That wasn’t really expected. 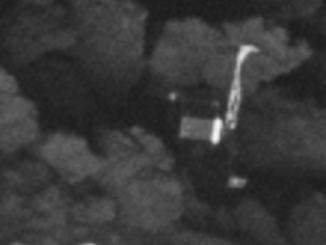 “The bluish hue is probably real,” he said of one south pole mosaic. “And the biggest feature is that Jupiter, from the poles, doesn’t look anything like it does from the equator. Mission managers tacked on the JunoCam imager to the spacecraft’s instrument package after NASA selected Juno for development in 2005. JunoCam was not originally part of the Juno mission, but officials added the camera as a public outreach tool. 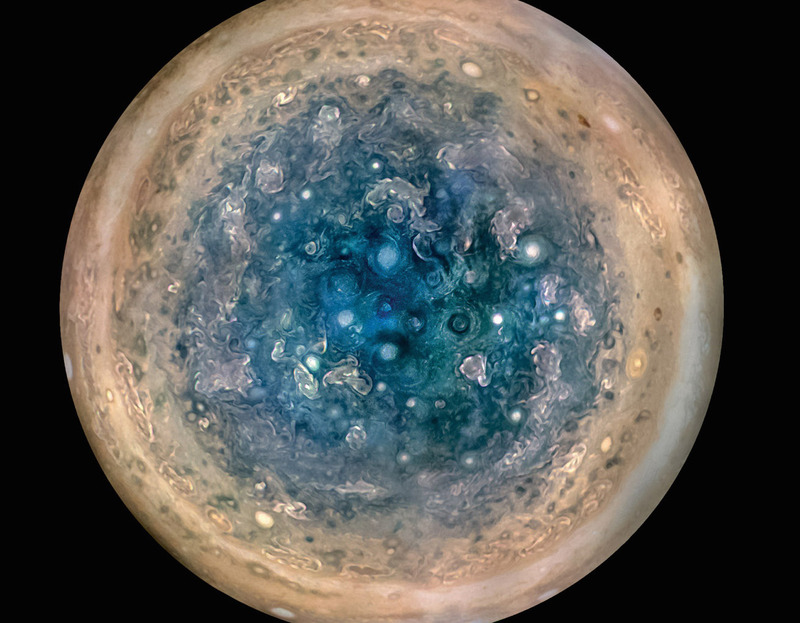 Scientists said JunoCam’s imagery adds context to their data analysis work, but it also engages a broader community of professional and amateur scientists, space enthusiasts and artists. 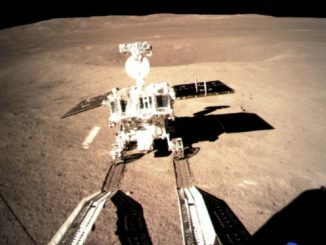 “The contributions of the amateurs are essential,” said Candy Hansen, Juno co-investigator at the Planetary Science Institute in Tucson, Arizona. “I cannot understate how important the contributions are. We don’t have a way to plan our data without the contributions of the amateur astronomers. “We don’t have a big image processing team, so we are completely relying on the help of our citizen scientists,” Hansen said. JunoCam collects images in strips as the spacecraft spins on its main axis, and contributors stitch the strips together to make pictures. Hansen said JunoCam has spotted “tiny” features suspended above Jupiter’s main cloud deck that look like squall lines on Earth. The clouds are dwarfed by Jupiter’s enormous scale, but they actually stretch around 30 miles, or 50 kilometers, across, she said. Juno’s next close-up encounter with Jupiter is set for July 11, when the orbiter will pass above the Great Red Spot for the first time. The discoveries made by Juno so far are “making us rethink how giant planets work, not just in our own solar system, but giant planets are really important throughout the galaxy and the universe,” Bolton said. “We’re getting the first really close-up and personal look at Jupiter, and we’re seeing that a lot of our ideas were incorrect, and maybe naive, that it’s very complex, and there are a lot of deep motions going on,” he added. NASA decided in February to forego an engine burn to move Juno into a 14-day orbit with a tighter path around Jupiter after engineers detected a problem with check valves inside the craft’s propulsion system last year. Juno’s mission will last until at least February 2018, enough time to make 11 science orbits around Jupiter, instead of the 32 laps originally planned. But NASA could extend the mission another three years to give Juno more flybys near Jupiter.